As shown in the figure below, there are four different zones in a typical refow profile – pre-heat, pre-heat and soak, reflow, and cooling zone. The incorrect setup with zone temperatures and times will cause different soldering defects. The solvent in flux vapours out too fast, causing some tiny paste areas to separate from the major paste area and forming individual solder balls around the component. Solder paste is oxidizing if the pre-heat too long. The PCB and components didn’t get an even heat up. The solvent in flux escaped too quickly. The flux lost its activity once it stayed soaking too long. Once the peak temperature is over 260°C and stays there for more than 10 sec, most of components will be damaged. 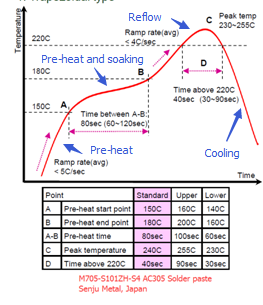 The peak temperature should be 20~25°C higher than the solder liquid point and remains there for 30~90 seconds. Components experienced thermal shock outside of their specifications. The slow cooling can easily lead to an excess amount of intermetallic compounds and produce larger crystal particles together in soldering joint, reducing the fatigue strength. PCB Assembly: How to Maintain a Reflow Oven? Previous：Why does Shenzhen Grande Use a 10 Zone Force air convection reflow oven?